A Queens County man admits he set the inside of Geeky Robar's Computers on fire; starting a late night blaze that grew to destroy multiple buildings in Bridgewater's downtown core last year. Adrian Thomas Hunt, 25, of Greenfield, pleaded guilty November 27 to arson; accepting responsibility for intentionally causing fire damage to a King Street building while being reckless as to whether the property was inhabited or occupied. In an agreed statement of facts, Hunt, who was identified by numerous tipsters after the Bridgewater Police Service publicly released footage from a closed caption television camera mounted on a light standard, said he lit things on fire that were already in the store. The document indicates Hunt "has not provided any explanation as to why he started the fire." He also "would not respond" when he was asked "if anyone put him up to it ..."
The Bridgewater volunteer fire department was summoned around 10:30 p.m. on October 22, 2017 to King Street, near the Old Bridge Street intersection, where the blaze was engulfing one building and eventually spread to adjoining buildings on the block. The fire also gutted three apartments on the upper levels of two buildings. 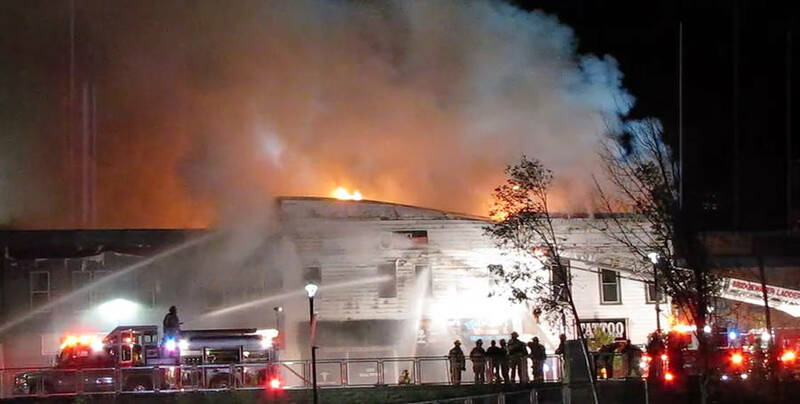 About a dozen volunteer fire departments, including ones from as far away as Chester and Liverpool, were brought in to the battle the blaze that lasted into the early morning hours. Businesses destroyed were: Big Daddy's Liquidation, Geeky Robar's Computers (which was located within Big Daddy's Liquidation), GreenWay Wellness Centre, Artistic Issues Tattoo Shop, Roger's World of Wireless, K.W. Select Realty and Vivid Graphic Design and Apparel. The lot where the fire still remains empty after fire debris was removed from the site. Meanwhile, The Lanna Thai restaurant nearby sustained significant smoke and water damage but wasn't destroyed. The eatery has yet to re-open. Insurance firms retained by property ownership, collectively, claimed losses over $1.4 million and are requesting restitution. The Town of Bridgewater is also requesting over $11,000 in reimbursement. Police obtained the video footage, which showed a man entering Big Daddy's Liquidation immediately prior to the fire and leaving again before smoke is seen billowing out of the front entrance. Authorities released a snippet of the video on December 18, 2017, showing the suspect walking on a King Street sidewalk. Hunt was identified by "numerous people." After his arrest on January 31, Hunt initially told law enforcement "he walked by and saw the fire through a window but he did not call police because he was scared he would be blamed." Hunt said he believed the next person on the scene would call for help. He went on to say he didn't think about the people living in the upstairs apartments, later admitting "he did a terrible thing" and "the fire got out of hand." Authorities found no evidence that any accelerant was used. George Crews, Liana Druin and Madelyn Myers lived in the impacted apartments, reads the agreed statement of facts. Crews moved to Bridgewater from Fort McMurray, Alberta after the wildfires there only to lose everything again in a fire here. He wasn't home at the time of the fire and was not insured. No restitution claim has been filed in his matter. Druin lost three of her cats in the fire. She only had her keys and cell phone when she left her apartment in a housecoat. She awoke to the sound of her smoke detector. Druin, who didn't have tenant's insurance, claims losses of over $44,000. Myers, who has tenant's insurance, was in bed when the fire started and got up after she smelled smoke. She left her apartment going down the steps to King Street. No restitution is sought in her case. Hunt is also charged with one count of break-and-enter with intent to commit an indictable offence, an allegation expected to be dealt with when he's sentenced in early January. In the meantime, he's participating in the preparation of a pre-sentence report, a document used to help the presiding judge decide on the appropriate punishment.